N95 respirator fit testing is required by OSHA on an annual basis for healthcare workers. Plus, it's a significant way to prevent your medical and support staff from exposure to airborne diseases. But fit testing comes with its own share of problems... Which of these headaches have you encountered? We got a PASS result on the fit test, but does the respirator really fit? A poor fitting mask won't stop infection. How do I test people that have no sense of smell or taste? If they're not sensitive to the testing agents we use, how do we complete the test? With sensitivity tests, comfort tests, and the seven-minute fit test, the process takes a long time. Isn't there a faster way? We waste a lot of time doing hand-written documentation, and with OSHA requirements, that's not a place I can cut corners. I wish we could automate it. If you answered YES to any of these questions, there's a faster, easier way to accomplish your goals. 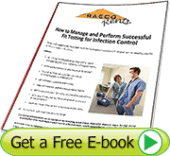 Get your free copy of How to Manage and Perform Successful Fit Testing for Infection Control. It's 32 pages of helpful articles, tips, and instructions to help you select the right fit test systems, and guide you through the whole process. If you have an immediate fit testing need, and would like to discuss your options, please feel free to call me at 866-736-8347.